A Juicing diet is perfect if you are looking for a healthy but highly effective weight loss plan. It will not only offer you the chance to loose weight but you’ll also discover many long-term health benefits of juicing. By following a juicing diet your body will benefit from the many vitamins and minerals that are found in fresh fruit and vegetables. It so easy to follow as all you need to do is prepare a regular supply of fresh juice. You can tailor the diet to your own particular taste by selecting fruit and vegetables that you prefer. You’ll have plenty of opportunity to vary your choice so that you don’t get bored of one flavour. In actual fact by giving your self more variety of juice you will benefit from a wider range of vitamins, nutrients and antioxidants. See some of my favourite juicing recipes for weight loss that should help you get started. By selecting recipes you will also be able to tailor your diet to fit your budget as certain fruit and vegetables cost less than others. The great advantage of a juicing diet is you are not starving yourself of food like other alternative fasting diets where you predominantly only drink water. Juicing is all about digesting fresh vegetables and fruit just in the form of a drink. Therefore you shouldn’t feel tired or spaced out on this diet in actual fact you might be surprised how revitalised and energised you feel. It is entirely up to you how long you want to follow a juicing diet. This will depend on your own health and the amount of weight you are looking to loose. But most importantly what you learn on the juicing diet will hopefully stay with you and be incorporated back into your normal every day eating plan after the diet. This will enable you to maintain the weight loss. As with any diet it’s all about following a sensible eating plan and engaging in regular physical exercise. 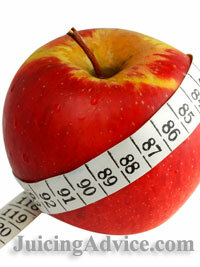 It is widely accepted that any diet is more effective when combined with exercise. On this diet it is also recommended that you drink a regular amount of water rather than drinks like tea and coffee. You may also want to seek medical advice before starting any diet. A juicing diet will not only give you short term success with weight loss it will also encourage you to develop healthy behaviours for the long term. You will discover all kinds of juices and be able use them as a replacement snack rather than reaching for the biscuits or chocolate. I hope you’ll also discover how much more energy and vitality you have. This will encourage you to keep juicing in your everyday life to maintain the new happier healthier you.